This library honors our neighbors lost in time. They live among us as long as we remember them. How To Use This Site - This is a regional site of three adjoining counties straddling the New York / Pennsylvania border. Historically and in all other ways this region is closely linked. I encourage all of you to not focus too much on one county without examining the others as well. Your ancestors very likely circulated throughout all of them and you must keep that in mind in your research. We have countless incidents of guests finding records in one of the adjoining counties where they would not have thought to look. The site is arranged with many of its features merged so that the counties are not kept separately. The newspaper circulation is one of many reasons for this as all of them publish material from all the other counties in this region in addition to their own. Think Regionally. Tri-Counties Genealogy and history site is an independent site founded, developed and owned by Joyce M. Tice. It is associated both with USGenWeb and ALHN both of which give entry to the Tri-Counties site through their state and county structure. Tri-Counties will continue to exist regardless of the status or longevity of any of the associated organizations with which I have formed alliances. They provide a door, but the site itself is the work of Joyce M. Tice and those who help her. Most vistitors to the site arrive via Google or other search engines. I rely heavily on volunteers to assist me in preparing materials for the site. Many work independently sending in materials that they have obtained and typed up for the site. Others work preparing materials that I have obtained and sent to them. I have ancestral roots in all three of the counties represented by my site and I have lived in all three of them. In 2002 I moved back to the northeast corner of Tioga County centrally located within the three counties represented on the site. I expect to spend the rest of my life working on the Sullivan-Rutland Genealogy Project. SRGP follows the ancestry and descendancy of residents of those townships. It was this project which got me started creating the Tri-Counties site. Tri-Counties is made available free of charge to the public by Joyce M. Tice. If you like the site and want to share the ways it has helped you and let me know about you, that will be very much appreciated. My primary reward in doing this is the contact I have with people who share my dedication to the area and who appreciate my site. If you do not find the site or something about it to your liking, you might consider whether complaints or criticism are warranted under the circumstances of its existence as a gift to the public. While complaints about the site are extremely rare, their effect is very damaging and inappropriate. Your participation in helping the site to develop is welcome. 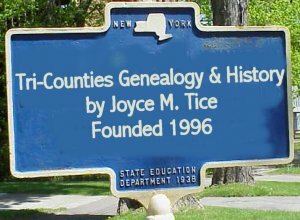 This site is most efficiently used by entering at the main page Tri-Counties Genealogy & History Sites of Joyce M. Tice. This is the page you should bookmark for future visits. It includes links to all three county pages and, more importantly, the resources that will help you in your research. This research facility has been under development since August 1996. It is updated almost daily with new features, so keep checking back regularly. Some of it is absolutely brand new today and some has been here a long time and needs renovation to bring it up to our present standards. However, it is not possible to go back and spruce up all of the drab pages and still move forward. So be tolerant of some of our early productions while we were still learning how to do this. New uploads are announced on the What's New page which is near the top of the site's main page. The county pages themselves link into the universal resources and are not developed as separate entities. Get in the habit of coming in the site's "Front Door" when you enter. Writing to Me - One of my favorite benefits of developing this site has been the opportunity to meet and develop friendships with people all over the world who share an interest in these counties and the people who inhabit(ed) them. I very much enjoy exchanging email with anyone who wants. Please, though, remember these points of courtesy. Consider that my brain has its capacity limits, also, and sign your first and last names whenever you write to me. I can't possibly remember you by your email address and it is a courtesy to identify yourself fully. Not signing your email is the social equivalent of walking into a room with a bag over your head or a mask, and it is not considered polite, even on the Internet. I may not respond to your email if it is not signed. Some days I receive a small amount of mail and have time to answer each one. Some days there are far more messages than I can handle and my schedule may be full of work commitments. To be honest, sometimes I really can not possibly answer all the mail and I hope none of you will take that as a snub or anything of the sort. Also, as much as I'd like to get involved with everyone's individual searches, there isn't time for me to do that. Your best bet on your individual issues, is to use the query system and thereby have the benefit of the collective knowledge of the hundreds of people who use that and who check in regularly. The site has grown very large and is very heavily used by thousands of people. It is just not possible for me to give individual assistance or answer individual questions. Many or even most of the questions I receive are addressed on the site and I have to rely on my guests to take the time to thoroughly learn the structure of the site and use it independently. That is the only way such a massive site can operate with only one person at the helm. The following instructions should help you in achieving that independence in using the site. The easiest way to navigate this massive site is via the Site Map bars on the current What's New page. The left bar lists all subject areas and the right bar lists all place areas. For those who don't like words, graphic buttons are at the bottoms of the What's New pages. The exception to individual help is if you are part of any of the families that are part of my personal Sullivan-Rutland Genealogy Project. If you are part of that population I most certainly want to hear from you. Also, I really enjoy hearing about how the site has been of benefit to you. Those messages, and the interesting things I learn, are my reward for the time and expense of developing the site. Two Way Street - Remember that the resources that make this site so successful have developed because many people have been willing to share what they have. If you have diaries, letters, pictures, deeds, wills, Bible records, school memorabilia, church records, whatever of historical importance relative to these three counties they can and should be submitted to the site so that you can give back some of what you get from your visits here. I recognize that all of you are here to see what you can get from your visit and that is appropriate. But it is also appropriate to give what you have that fits into the subject content of this site. The best way to submit data is in MS Word documents. If it is columnar material, use Excel instead. Photos should be submitted at high resolution as JPG files. I can always reduce photos later but I can not put back resolution that I don't receive in the first place. All guest who submit materials are credited with the submission. The CORE of the site are the eighty town/township pages. Every Township in the whole three counties has its own page. On the main site page is the TRI-COUNTY TOWNSHIP INDEX which links to each of the many township pages of all three counties. They include cemetery records, family histories, township histories, census records, anything that relates to that township. Additionally the Online Research Library discussed above has links to Township Indices that list the township for one county only. When I announce a new addition on the mail list and refer you to the Township Pages, you can find it easily on the Township Index even if you do not know the county. You can also link to all the townships in the three counties from the right sidebar of any current What's New Page which is designed as your central navigational launch pad. The townsjhips are color coded to tellyou the county it is in. A fundamental part of The Site is the ONLINE RESEARCH LIBRARY which is arranged in columns, one general column and one for each county where materials are county specific. This will link you to whatever is available, whole reference books, hundreds of pages of obituaries, family histories submitted by other guests, information about research facilities and vital records. Its front door is right on the main page and it has many, many rooms that you will want to explore. Don't forget to go all the way to the bottom as there are additional county sections further down the page, links to other resources of interest, and lots of treasures. QUERIES - We are no longer posting or maintaining queries. There are now many other avenues of cummunication that have replaced it from our early days back in 1996 - the dawn of onbline resarch. Additionally we have the Tri Counties Cemetery Index and the Tri-County Census Index. These link to nothing that the township pages do not, but if you don't know what township a cemetery is in you can find it and link to it from the Cemetery List which includes all of the 700 plus cemeteries in the region. Other features include the Search Engines which link from the main page as well. The search engine is at the bootom of the current What's New Page and it is paritioned to allow you to search a single segement (category) of the site at a time. A repeat from above - The easiest way to navigate this massive site is via the Site Map bars on any What's New page. The left bar lists all subject areas and the right bar lists all place areas. For those who don't like words, graphic buttons are at the bottoms of the What's New pages. STATEMENT OF PURPOSE - This site, which is founded, maintained, and developed by Joyce M. Tice, (with a LOT of help from her friends) is dedicated to preserving the memory of our pioneer ancestors and the history of the area in which they lived. I do it for them. Additionally, I want to encourage people to look at the whole environment to understand the lives these women and men lived, the hardships they endured when our area was under development, and the lasting contributions they made in their lives to the world in which we now live. The function of the site is education, preservation of historic materials, and distribution with ease to the public. My process for doing that is to build an electronic library which people can both use independently and add to with their own submissions. While the role of our local historical societies and libraries in preserving historical artifacts is unquestionably invaluable, many thousands of people, with an interest in our area and its history, will never have the opportunity or the money to come here and visit them. This site is their only available and affordable window to our part of the world. Also many valuable local artifacts have been carried all over the country by the descendants of our emmigrants. Those people do not want to give their family artifact to an organization back here, but they will welcome the opportunity to share its image or content with this electronic library, thereby preserving its historic value from the dangers of fire and deterioration and discarding by those not recognizing its significance. It gives many of our materials an opportunity to be displayed among other artifacts from the place of origin without giving them up. This site is a library, a museum, a central repository in electronic format for our history. While some pages of the site represent my own research and authorship, my main role is as editor and publisher of materials sent in by others. In my approach to history, I don't believe that you can study people without an understanding of the TIME and PLACE in which they lived, and you can not understand communities without understanding the people who created and lived in them. So Tri-Counties site is structured around the COMMUNITIES of this three county area. To fulfill this purpose it is necessary to motivate present day members of these communities to share their knowledge and artifacts with us. There are many communities within this large area, and I am not personally an expert on all of them. To develop all the many local community collections as they deserve, requires those who know them better than I to come forward and help us help you and help them in return. People from all over the country also have memorabilia that has passed through their families and which reflect these communities in an earlier era. They too can be part of this project by submitting what they have, by sending it "back home" via the electronic media we now rely on for our presentation. Haul it out of your attic where its value is hidden and share it with us. Don't be a squirrel hiding away your interesting historical items. For information on how to do that just click the SUBMIT button on the left bar of any What's New page. The stated purpose of this site can only be fulfilled with the help of many hundreds of people with an attitude of preservation and sharing. A particular focus is intended for the women. Many present day researchers, using the example given them in the nineteenth century histories, tend to focus on their male ancestry and minimize the contributions of their female ancestors. Genealogy is about genes, not names, so don't forget the women even though our marriage customs take most of their names from them. Hopefully, with an occasional reminder, we can restore these women to their rightful place in history and give them respect they have always deserved. If you submit family hstories entitled in the format of Descendants of John Doe, I will as editor change the title to include the female progenitor in equal status. This is also intended as a communication forum for present day descendants of these pioneers to get together to exchange information, learn about the area, and have a good time doing it. Photos of the area not only decorate the pages, but are intended to give those of you from other areas, a feel for the geography and culture of this area past and present as well as its flora and fauna. This is a place to do your research and enjoy yourself at the same time. Those who volunteer their time to site development have the most fun of all, and we learn the most. Enjoy yourself as a guest at my site and good luck researching. This site, just like my own Sullivan-Rutland Genealogy Project, takes a community focus. It is not only about individual people, but also the community in which they lived and the people they lived with and near. If your own research has not expanded to that community level, I'd recommend that you consider it. You will never understand your ancestor until you understand the world in which she lived. Poet and novelist, Thomas Hardy, has expressed they WHY of this site far better than I have. His message follows. Below are current addresses for some of the prime preparers of site materials whom you may wish to contact. If you can't find the search engine, read the How to Use the Site page before writing to me about that. Questions to me about the site are OK to JoyceTice@aol.com AFTER you have read the How to use the Site Page and followed its guidelines to find what you need. If you are writing me about something you have found on my site youMUST identify the exact page by URL - That is the address that begins with http:// etc. With a site so massive, I can not process your question or addition without that essential piece of information. Please, please, please. One cannot maintain 17,000 pages without that level of assistance. For issues relating ONLY to Sullivan-Rutland Genealogy Project by Joyce M. Tice put SRGP in the heading so I know it refers to my own personal study and not general Tri-County. I am always glad to hear how the site has helped you and to receive additional materials for the site. Be sure to sign your first and last name so I know who you are. I may not repond to unsigned emails and AOL does not register your name so I can see it.If you don't sign I only see an email address and that is not enough for me to know who you are. I will think you are rude or disrespectful to write anonymously. If you have written to me with a question be very certain you are not blocking my replies. It takes my time away from site development to answer you and it is very disturbing to have it come back because you are blocking emails. Please do not use fancy backgrounds or icons that create file attachments. If I do not know who you are I may be unwilling to open an email with file attachments. My computer system is critical to the continuation of the site, and I can not risk virus transmissions. If you are attaching a file or photographs for the site, note it in the email subject heading so I can see it before I open the email. If answering your question requires me to fill out a form, I will not take the time to do it. If you want an answer please clear me for acceptance BEFORE you writee to me. It takes my time to answer you and then when it is rejected I feel VERY abused and feel that my time has been misused..
Be sure you have read the How To Use the Site Page for general guidelines on using the site first. If your note to me includes further questions than are already covered on the site, it may take me several weeks to respond to you. If you are asking for more informaiton than is already on the site, do be sure it is not already there. Please make yourself aware of these massive resources before asking for more. If you ask for more than the many thousands of pages already gifted to you, you should also be willing to be part of the large group of people helping the site grow and develop. .
Click your BACK button or click here to return to the main page of the site.